Small cell lung cancer (SCLC) is one of the common malignant conditions of the lungs. Read and find out all about the disease, including its diverse symptoms, causes, treatment options and more. SCLC is the name given to a form of lung cancer that has a fast progression. It spreads in a much faster manner than NSCLC (Non- small cell lung cancer). SCLC accounts for about 20-25% of all forms of lung cancer. The majority of SCLCs are of the first form. Lung cancer is responsible for the death of around 160,000 individuals in the U.S every year. SCLC accounts for 15% of all cases of lung cancer. Males are slightly more prone to this disorder than females. This is the most aggressive type of lung cancer. It generally arises in the bronchi (breathing tubes) in the middle of the chest. 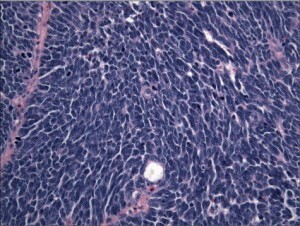 The cancer cells, although small in size, grow very fast and give rise to large tumors. These tumors often metastasize very quickly to other regions of the body, including the bone, liver and brain. Nearly all cases of this condition occur as a result of smoking cigarettes. It is rare in people who have never smoked in life. 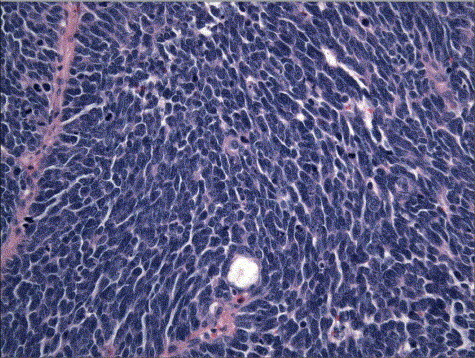 SCLC is often associated with distinct paraneoplastic syndromes, a collection of symptoms that arise from substances manufactured by the tumor. Active or passive smoking of cigarettes is the major risk factor for this disorder. According to one particular study, smoking of cigarettes has been associated with bigger tumors than non-smoking during the time of presentation. Cancerous conditions of the lungs are also associated with advanced age. Those with an earlier history of cancer, particularly those of neck and head, are also more susceptible to lung cancers. Individuals with Chronic Obstructive Pulmonary Disease (COPD) are also more prone to SCLC. Exposure to industrial dusts such as arsenic, chromium, asbestos and iron oxides can give rise to industrial dust disorders and make a person more susceptible to SCLC. Exposure to asbestos is said to increase the risk of lung cancer by 9 times. A combination of cigarette smoking and asbestos exposure increases the risk of SCLC by as much as 50 times. The risk of SCLC is most common in individuals who mine Uranium. The diagnosis of this disorder begins with a physical examination of patients and asking them about their medical history. Patients are enquired whether or not they smoke, and if they do – the amount and duration of their smoking are also taken into account. During physical examination, doctors listen to the chest with the aid of a stethoscope. At the time of this exam, they can sometimes hear sounds produced by the fluid around the lungs or the regions where the lungs suffers a partial collapse. Each of these results can indicate cancer, although that is not always the case. By the time of diagnosis, SCLC usually spreads to other sections of the body of sufferers. In some cases, the areas where cancer is found to spread are noticed as large tumors on imaging tests such as x-rays. Early on, however, these regions may not be visible although they may still be there. The common lab tests for this disease include testing of samples of urine, blood and other substances in the body. These exams can help diagnose the disorder, develop treatment plan and monitor the condition over a period of time. In this form, the cancer is only in one side of the chest and can be cured with the aid of radiation therapy. It involves only one section of the lung and adjoining lymph nodes. In this form, cancer is found to have spread in the region outside the chest. Physicians should make sure that patients are not suffering from any of the aforementioned conditions and the symptoms that they are experiencing are those of SCLC only. 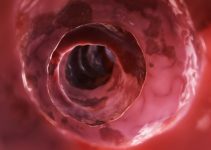 As this cancerous condition quickly spreads all through the body, its treatment must involve oral administration or injection of chemotherapy medications. Generally, the chemotherapy medicine known as Etoposide (or Irinotecan in some cases) is combined with either Carboplatin or Cisplatin. A combination of radiation treatment and chemotherapy is given to individuals in whom SCLC has spread all through the body. However, this type of treatment only helps to alleviate the symptoms and not cure the disease itself. Often, the cancer may have already spread to the brain even in the absence of any symptoms or other cancerous signs in the brain. 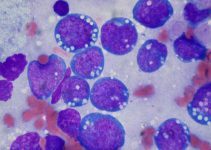 Due to this reason, radiation therapy may be administered to certain patients with smaller cancers or those who showed a positive response in the first round of chemotherapy. This procedure is referred to as Prophylactic cranial irradiation (PCI). Very few SCLC sufferers are aided by surgery as the disease is found to have often metastasized by the time it is detected. Operation may be carried out when there is only a single tumor that has not spread. If surgery is performed, radiation therapy or chemotherapy will be required still. The outcome of the condition depends on the extent of spread of this form of lung cancer. This form of cancer is extremely life-threatening. Only around 6% of all SCLC patients manage to survive even 5 years after detection. If the malignancy is checked in the initial stages, the five year survival-rate is found to be only 20%. Patients generally live for less than one year once cancer enters an advanced stage. The earlier the condition is diagnosed and treated, the better the chances of survival are. The disorder shows a good response to chemotherapy and radiation therapy. Unfortunately, for all advances in medicine, there has been little change in life expectancy associated with this condition for the last two decades. This is true for both the limited as well as the extensive form of SCLC. As the disorder is found to arise mainly as a result of smoking, it is wise to give up smoking. Those who do not smoke should avoid the company of smokers to prevent secondhand smoke or passive smoke. In high-risk populations, lung-cancer screening programs should be used. Those engaged in industrial professions should avoid occupational exposure to carcinogens. Numerous studies indicate that acquiring more information about lung cancer can improve the quality of life and possibly even the outcome of the disorder. Patients would do better to learn about clinical trials for this disease. Clinical trials, at present, are in progress for both stages of SCLC. These help in evaluating new treat options and curative combinations for this form of aggressive cancer. According to NCI (National Cancer Institute), everyone with SCLC may be considered for involvement in clinical trials. SCLC patients and their friends or family members can get in touch with the various support groups that exist to provide guidance and information to sufferers of this disorder. 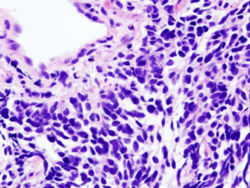 The following images demonstrate the appearance of cancerous lung cells in SCLC patients. If you suspect yourself to be suffering from signs of Small cell lung cancer, get in touch with a healthcare provider as fast as you can. This is particularly important if you are a smoker. Early treatment can check the malignant condition at its early stage and increase your chances of making a complete and faster recovery from this disorder.